The Cyber Software Development Kit (SDK) are ActiveX spreadsheet grid plug-in's for the Visual C++, and Visual Basic developers who needs more from a control than what is generally found today. Most of the tools for Visual C++ are based on Visual Basic and when writing complex packages, cannot meet the true requirements of Visual C++. The SDK controls are true Visual C++ components and supply a level of functionality to meet the basic requirements of the traditional Visual Basic developer, and yet can also deliver the high level of functionality required by the innovative Visual C++ developer. The SDK installation comes with plenty of example programs, written in a tutorial style, step by step instruction guide to teach you about the controls. The Help facilities provided are well written with plenty of examples. There is no guess work in how to use the Cyberinformatix SDK controls. The Sample-program-tutorials are easy to understand written in a clear and concise manner. The Cyber Navigator ActiveX visual display control unit was designed to navigate the Microsoft Access database tables and serve as a helper control for the CyberGrid. The methods exposed give the developer complete control of the navigator's internal tasking processes. 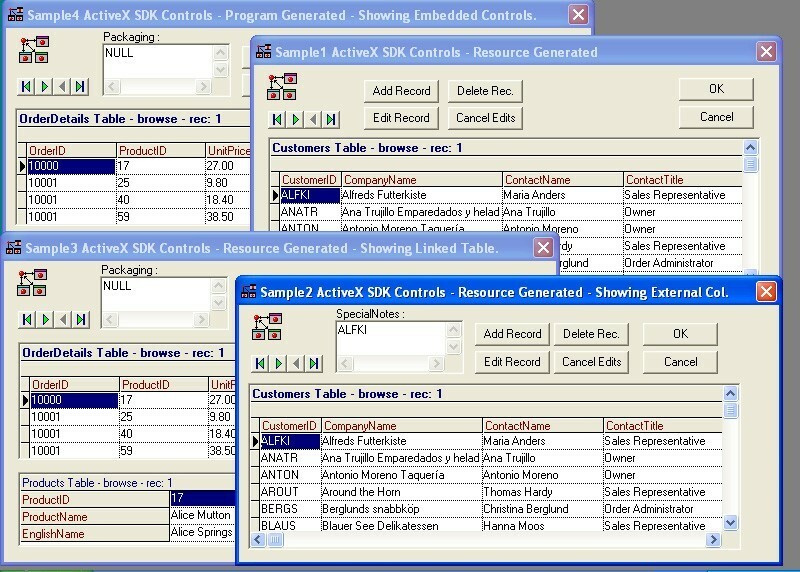 The CyberGrid ActiveX visual display control unit was designed to input or extract data from the Microsoft Access database tables. The CyberGrid was designed around the military/engineering environment and boasts of having a small memory footprint, yet capable of handling extremely large volumes of data, and do complex operations through the use of a number of easy to use methods. Some of the features (and there are more) is the ability to change to a multi record display grid or a single record display unit. In the record display mode the grid sets itself up sideways, where the columns, and column descriptions are displayed down the page, instead of along. The columns now become the rows.